Air NZ & the All-Blacks have reaffirmed their partnership for the 2014 season. Air New Zealand has re-committed to supporting the country’s famous All-Blacks rugby team for the 2014 season. The airline says it will launch a global campaign promoting the association between the two well-known brands, featuring some of the All-Blacks players. 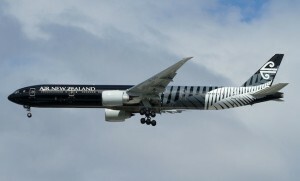 I am wondering if that means their first or all of their B789s will be in “All Blacks” too? ZK-NZE will be the first 789 delivered and as the flagship of the Dreamliner fleet it will be painted in a special ‘all black’ edition of their new livery (as seen on a couple of existing A320 and 777 aircraft), while the next 2 to be delivered, ZK-NZC and ZK-NZD (yes they are out of sequence) and remaining 7 aircraft will receive the more standard white-and-black treatment.